The native form of this personal name is Neumann János Lajos. This article uses Western name order when mentioning individuals. John von Neumann (/vɒn ˈnɔɪmən/; Hungarian: Neumann János Lajos, pronounced [ˈnɒjmɒn ˈjaːnoʃ ˈlɒjoʃ]; December 28, 1903 – February 8, 1957) was a Hungarian-American mathematician, physicist, computer scientist, and polymath. Von Neumann was generally regarded as the foremost mathematician of his time and said to be "the last representative of the great mathematicians"; a genius who was comfortable integrating both pure and applied sciences. He made major contributions to a number of fields, including mathematics (foundations of mathematics, functional analysis, ergodic theory, representation theory, operator algebras, geometry, topology, and numerical analysis), physics (quantum mechanics, hydrodynamics, and quantum statistical mechanics), economics (game theory), computing (Von Neumann architecture, linear programming, self-replicating machines, stochastic computing), and statistics. He was a pioneer of the application of operator theory to quantum mechanics in the development of functional analysis, and a key figure in the development of game theory and the concepts of cellular automata, the universal constructor and the digital computer. He published over 150 papers in his life: about 60 in pure mathematics, 60 in applied mathematics, 20 in physics, and the remainder on special mathematical subjects or non-mathematical ones. His last work, an unfinished manuscript written while in hospital, was later published in book form as The Computer and the Brain. His analysis of the structure of self-replication preceded the discovery of the structure of DNA. In a short list of facts about his life he submitted to the National Academy of Sciences, he stated, "The part of my work I consider most essential is that on quantum mechanics, which developed in Göttingen in 1926, and subsequently in Berlin in 1927–1929. Also, my work on various forms of operator theory, Berlin 1930 and Princeton 1935–1939; on the ergodic theorem, Princeton, 1931–1932." During World War II, von Neumann worked on the Manhattan Project with theoretical physicist Edward Teller, mathematician Stanisław Ulam and others, problem solving key steps in the nuclear physics involved in thermonuclear reactions and the hydrogen bomb. He developed the mathematical models behind the explosive lenses used in the implosion-type nuclear weapon, and coined the term "kiloton" (of TNT), as a measure of the explosive force generated. After the war, he served on the General Advisory Committee of the United States Atomic Energy Commission, and consulted for a number of organizations, including the United States Air Force, the Army's Ballistic Research Laboratory, the Armed Forces Special Weapons Project, and the Lawrence Livermore National Laboratory. As a Hungarian émigré, concerned that the Soviets would achieve nuclear superiority, he designed and promoted the policy of mutually assured destruction to limit the arms race. Von Neumann's birthplace, at 16 Báthory Street, Budapest. Since 1968, it has housed the John von Neumann Computer Society. Von Neumann was born Neumann János Lajos to a wealthy, acculturated and non-observant Jewish family (in Hungarian the family name comes first. His given names equate to John Louis in English). After his arrival in the U.S. he had been baptized a Roman Catholic prior to the marriage to his Catholic first wife. Von Neumann was born in Budapest, Kingdom of Hungary, which was then part of the Austro-Hungarian Empire. He was the eldest of three brothers; his two younger siblings were Mihály (English: Michael von Neumann; 1907–1989) and Miklós (Nicholas von Neumann, 1911–2011). His father, Neumann Miksa (Max von Neumann, 1873–1928) was a banker, who held a doctorate in law. He had moved to Budapest from Pécs at the end of the 1880s. Miksa's father and grandfather were both born in Ond (now part of the town of Szerencs), Zemplén County, northern Hungary. John's mother was Kann Margit (English: Margaret Kann); her parents were Jakab Kann and Katalin Meisels. Three generations of the Kann family lived in spacious apartments above the Kann-Heller offices in Budapest; von Neumann's family occupied an 18-room apartment on the top floor. On February 20, 1913, Emperor Franz Joseph elevated John's father to the Hungarian nobility for his service to the Austro-Hungarian Empire. The Neumann family thus acquired the hereditary appellation Margittai, meaning "of Margitta" (today Marghita, Romania). The family had no connection with the town; the appellation was chosen in reference to Margaret, as was their chosen coat of arms depicting three marguerites. Neumann János became margittai Neumann János (John Neumann de Margitta), which he later changed to the German Johann von Neumann. Von Neumann was a child prodigy. When he was 6 years old, he could divide two 8-digit numbers in his head and could converse in Ancient Greek. When the 6-year-old von Neumann caught his mother staring aimlessly, he asked her, "What are you calculating?" Children did not begin formal schooling in Hungary until they were ten years of age; governesses taught von Neumann, his brothers and his cousins. Max believed that knowledge of languages in addition to Hungarian was essential, so the children were tutored in English, French, German and Italian. By the age of 8, von Neumann was familiar with differential and integral calculus, but he was particularly interested in history. He read his way through Wilhelm Oncken's 46-volume Allgemeine Geschichte in Einzeldarstellungen. A copy was contained in a private library Max purchased. One of the rooms in the apartment was converted into a library and reading room, with bookshelves from ceiling to floor. Von Neumann entered the Lutheran Fasori Evangélikus Gimnázium in 1911. Eugene Wigner was a year ahead of von Neumann at the Lutheran School and soon became his friend. This was one of the best schools in Budapest and was part of a brilliant education system designed for the elite. Under the Hungarian system, children received all their education at the one gymnasium. The Hungarian school system produced a generation noted for intellectual achievement, which included Theodore von Kármán (b. 1881), George de Hevesy (b. 1885), Michael Polanyi (b. 1891), Leó Szilárd (b. 1898), Dennis Gabor (b. 1900), Wigner (b. 1902), Edward Teller (b. 1908), and Paul Erdős (b. 1913). Collectively, they were sometimes known as "The Martians". Although Max insisted von Neumann attend school at the grade level appropriate to his age, he agreed to hire private tutors to give him advanced instruction in those areas in which he had displayed an aptitude. At the age of 15, he began to study advanced calculus under the renowned analyst Gábor Szegő. On their first meeting, Szegő was so astounded with the boy's mathematical talent that he was brought to tears. Some of von Neumann's instant solutions to the problems that Szegő posed in calculus are sketched out on his father's stationery and are still on display at the von Neumann archive in Budapest. By the age of 19, von Neumann had published two major mathematical papers, the second of which gave the modern definition of ordinal numbers, which superseded Georg Cantor's definition. At the conclusion of his education at the gymnasium, von Neumann sat for and won the Eötvös Prize, a national prize for mathematics. According to his friend Theodore von Kármán, von Neumann's father wanted John to follow him into industry and thereby invest his time in a more financially useful endeavor than mathematics. In fact, his father requested Theodore von Kármán to persuade his son not to take mathematics as his major. Von Neumann and his father decided that the best career path was to become a chemical engineer. This was not something that von Neumann had much knowledge of, so it was arranged for him to take a two-year, non-degree course in chemistry at the University of Berlin, after which he sat for the entrance exam to the prestigious ETH Zurich, which he passed in September 1923. At the same time, von Neumann also entered Pázmány Péter University in Budapest, as a Ph.D. candidate in mathematics. For his thesis, he chose to produce an axiomatization of Cantor's set theory. He graduated as a chemical engineer from ETH Zurich in 1926 (although Wigner says that von Neumann was never very attached to the subject of chemistry), and passed his final examinations for his Ph.D. in mathematics simultaneously with his chemical engineering degree, of which Wigner wrote, "Evidently a Ph.D. thesis and examination did not constitute an appreciable effort." He then went to the University of Göttingen on a grant from the Rockefeller Foundation to study mathematics under David Hilbert. 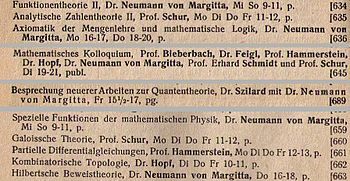 Excerpt from the university calendars for 1928 and 1928/29 of the Friedrich-Wilhelms-Universität Berlin announcing Neumann's lectures on axiomatic set theory and mathematical logic, new work in quantum mechanics and special functions of mathematical physics. Von Neumann's habilitation was completed on December 13, 1927, and he started his lectures as a Privatdozent at the University of Berlin in 1928, being the youngest person ever elected Privatdozent in the university's history in any subject. By the end of 1927, von Neumann had published twelve major papers in mathematics, and by the end of 1929, thirty-two papers, at a rate of nearly one major paper per month. His reputed powers of memorization and recall allowed him to quickly memorize the pages of telephone directories, and recite the names, addresses and numbers therein. In 1929, he briefly became a Privatdozent at the University of Hamburg, where the prospects of becoming a tenured professor were better, but in October of that year a better offer presented itself when he was invited to Princeton University in Princeton, New Jersey. On New Year's Day in 1930, von Neumann married Marietta Kövesi, who had studied economics at Budapest University. Von Neumann and Marietta had one child, a daughter, Marina, born in 1935. As of 2017, she is a distinguished professor of business administration and public policy at the University of Michigan. The couple divorced in 1937. In October 1938, von Neumann married Klara Dan, whom he had met during his last trips back to Budapest prior to the outbreak of World War II. Prior to his marriage to Marietta, von Neumann was baptized a Catholic in 1930. Von Neumann's father, Max, had died in 1929. None of the family had converted to Christianity while Max was alive, but all did afterward. In 1933, he was offered a lifetime professorship on the faculty of the Institute for Advanced Study in New Jersey when that institution's plan to appoint Hermann Weyl fell through. He remained a mathematics professor there until his death, although he had announced his intention to resign and become a professor at large at the University of California. His mother, brothers and in-laws followed von Neumann to the United States in 1939. Von Neumann anglicized his first name to John, keeping the German-aristocratic surname of von Neumann. His brothers changed theirs to "Neumann" and "Vonneumann". 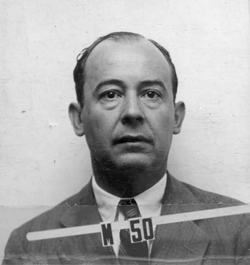 Von Neumann became a naturalized citizen of the United States in 1937, and immediately tried to become a lieutenant in the United States Army's Officers Reserve Corps. He passed the exams easily, but was ultimately rejected because of his age. His prewar analysis of how France would stand up to Germany is often quoted: "Oh, France won't matter." Klara and John von Neumann were socially active within the local academic community. His white clapboard house at 26 Westcott Road was one of the largest private residences in Princeton. He took great care of his clothing and would always wear formal suits. He once wore a three-piece pinstripe when he rode down the Grand Canyon astride a mule. Hilbert is reported to have asked "Pray, who is the candidate's tailor?" at von Neumann's 1926 doctoral exam, as he had never seen such beautiful evening clothes. Von Neumann held a lifelong passion for ancient history, being renowned for his prodigious historical knowledge. A professor of Byzantine history at Princeton once said that von Neumann had greater expertise in Byzantine history than he did. Von Neumann liked to eat and drink; his wife, Klara, said that he could count everything except calories. He enjoyed Yiddish and "off-color" humor (especially limericks). He was a non-smoker. In Princeton, he received complaints for regularly playing extremely loud German march music on his gramophone, which distracted those in neighboring offices, including Albert Einstein, from their work. Von Neumann did some of his best work in noisy, chaotic environments, and once admonished his wife for preparing a quiet study for him to work in. He never used it, preferring the couple's living room with its television playing loudly. Despite being a notoriously bad driver, he nonetheless enjoyed driving—frequently while reading a book—occasioning numerous arrests as well as accidents. When Cuthbert Hurd hired him as a consultant to IBM, Hurd often quietly paid the fines for his traffic tickets. Von Neumann's closest friend in the United States was mathematician Stanisław Ulam. A later friend of Ulam's, Gian-Carlo Rota, wrote, "They would spend hours on end gossiping and giggling, swapping Jewish jokes, and drifting in and out of mathematical talk." When von Neumann was dying in the hospital, every time Ulam visited, he came prepared with a new collection of jokes to cheer him up. He believed that much of his mathematical thought occurred intuitively, and he would often go to sleep with a problem unsolved and know the answer immediately upon waking up. Ulam noted that von Neumann's way of thinking might not be visual, but more aural. The axiomatization of mathematics, on the model of Euclid's Elements, had reached new levels of rigour and breadth at the end of the 19th century, particularly in arithmetic, thanks to the axiom schema of Richard Dedekind and Charles Sanders Peirce, and in geometry, thanks to Hilbert's axioms. But at the beginning of the 20th century, efforts to base mathematics on naive set theory suffered a setback due to Russell's paradox (on the set of all sets that do not belong to themselves). The problem of an adequate axiomatization of set theory was resolved implicitly about twenty years later by Ernst Zermelo and Abraham Fraenkel. Zermelo–Fraenkel set theory provided a series of principles that allowed for the construction of the sets used in the everyday practice of mathematics, but they did not explicitly exclude the possibility of the existence of a set that belongs to itself. In his doctoral thesis of 1925, von Neumann demonstrated two techniques to exclude such sets—the axiom of foundation and the notion of class. The axiom of foundation proposed that every set can be constructed from the bottom up in an ordered succession of steps by way of the principles of Zermelo and Fraenkel. If one set belongs to another then the first must necessarily come before the second in the succession. This excludes the possibility of a set belonging to itself. To demonstrate that the addition of this new axiom to the others did not produce contradictions, von Neumann introduced a method of demonstration, called the method of inner models, which later became an essential instrument in set theory. The second approach to the problem of sets belonging to themselves took as its base the notion of class, and defines a set as a class which belongs to other classes, while a proper class is defined as a class which does not belong to other classes. Under the Zermelo–Fraenkel approach, the axioms impede the construction of a set of all sets which do not belong to themselves. In contrast, under the von Neumann approach, the class of all sets which do not belong to themselves can be constructed, but it is a proper class and not a set. With this contribution of von Neumann, the axiomatic system of the theory of sets avoided the contradictions of earlier systems, and became usable as a foundation for mathematics, despite the lack of a proof of its consistency. The next question was whether it provided definitive answers to all mathematical questions that could be posed in it, or whether it might be improved by adding stronger axioms that could be used to prove a broader class of theorems. A strongly negative answer to whether it was definitive arrived in September 1930 at the historic mathematical Congress of Königsberg, in which Kurt Gödel announced his first theorem of incompleteness: the usual axiomatic systems are incomplete, in the sense that they cannot prove every truth which is expressible in their language. Moreover, every consistent extension of these systems would necessarily remain incomplete. Less than a month later, von Neumann, who had participated at the Congress, communicated to Gödel an interesting consequence of his theorem: that the usual axiomatic systems are unable to demonstrate their own consistency. However, Gödel had already discovered this consequence, now known as his second incompleteness theorem, and he sent von Neumann a preprint of his article containing both incompleteness theorems. Von Neumann acknowledged Gödel's priority in his next letter. He never thought much of "the American system of claiming personal priority for everything." Building on the work of Felix Hausdorff, in 1924 Stefan Banach and Alfred Tarski proved that given a solid ball in 3‑dimensional space, there exists a decomposition of the ball into a finite number of disjoint subsets, that can be reassembled together in a different way to yield two identical copies of the original ball. Banach and Tarski proved that, using isometric transformations, the result of taking apart and reassembling a two-dimensional figure would necessarily have the same area as the original. This would make creating two unit squares out of one impossible. However, in a 1929 paper, von Neumann proved that paradoxical decompositions could use a group of transformations that include as a subgroup a free group with two generators. The group of area-preserving transformations contains such subgroups, and this opens the possibility of performing paradoxical decompositions using these subgroups. The class of groups isolated by von Neumann in his work on Banach–Tarski decompositions subsequently was very important for many areas of mathematics, including von Neumann's own later work in measure theory (see below). In a series of famous papers that were published in 1932, von Neumann made foundational contributions to ergodic theory, a branch of mathematics that involves the states of dynamical systems with an invariant measure. Of the 1932 papers on ergodic theory, Paul Halmos writes that even "if von Neumann had never done anything else, they would have been sufficient to guarantee him mathematical immortality". By then von Neumann had already written his famous articles on operator theory, and the application of this work was instrumental in the von Neumann mean ergodic theorem. Von Neumann introduced the study of rings of operators, through the von Neumann algebras. A von Neumann algebra is a *-algebra of bounded operators on a Hilbert space that is closed in the weak operator topology and contains the identity operator. The von Neumann bicommutant theorem shows that the analytic definition is equivalent to a purely algebraic definition as being equal to the bicommutant. Von Neumann embarked in 1936, with the partial collaboration of F.J. Murray, on the general study of factors classification of von Neumann algebras. The six major papers in which he developed that theory between 1936 and 1940 "rank among the masterpieces of analysis in the twentieth century". The direct integral was later introduced in 1949 by John von Neumann. In measure theory, the "problem of measure" for an n-dimensional Euclidean space Rn may be stated as: "does there exist a positive, normalized, invariant, and additive set function on the class of all subsets of Rn?" The work of Felix Hausdorff and Stefan Banach had implied that the problem of measure has a positive solution if n = 1 or n = 2 and a negative solution (because of the Banach–Tarski paradox) in all other cases. Von Neumann's work argued that the "problem is essentially group-theoretic in character": the existence of a measure could be determined by looking at the properties of the transformation group of the given space. The positive solution for spaces of dimension at most two, and the negative solution for higher dimensions, comes from the fact that the Euclidean group is a solvable group for dimension at most two, and is not solvable for higher dimensions. "Thus, according to von Neumann, it is the change of group that makes a difference, not the change of space." In a number of von Neumann's papers, the methods of argument he employed are considered even more significant than the results. In anticipation of his later study of dimension theory in algebras of operators, von Neumann used results on equivalence by finite decomposition, and reformulated the problem of measure in terms of functions. In his 1936 paper on analytic measure theory, he used the Haar theorem in the solution of Hilbert's fifth problem in the case of compact groups. In 1938, he was awarded the Bôcher Memorial Prize for his work in analysis. Von Neumann founded the field of continuous geometry. It followed his path-breaking work on rings of operators. In mathematics, continuous geometry is a substitute of complex projective geometry, where instead of the dimension of a subspace being in a discrete set 0, 1, ..., n, it can be an element of the unit interval [0,1]. Earlier, Menger and Birkhoff had axiomatized complex projective geometry in terms of the properties of its lattice of linear subspaces. Von Neumann, following his work on rings of operators, weakened those axioms to describe a broader class of lattices, the continuous geometries. While the dimensions of the subspaces of projective geometries are a discrete set (the non-negative integers), the dimensions of the elements of a continuous geometry can range continuously across the unit interval [0,1]. Von Neumann was motivated by his discovery of von Neumann algebras with a dimension function taking a continuous range of dimensions, and the first example of a continuous geometry other than projective space was the projections of the hyperfinite type II factor. Between 1937 and 1939, von Neumann worked on lattice theory, the theory of partially ordered sets in which every two elements have a greatest lower bound and a least upper bound. Garrett Birkhoff writes: "John von Neumann's brilliant mind blazed over lattice theory like a meteor". Von Neumann provided an abstract exploration of dimension in completed complemented modular topological lattices (properties that arise in the lattices of subspaces of inner product spaces): "Dimension is determined, up to a positive linear transformation, by the following two properties. It is conserved by perspective mappings ("perspectivities") and ordered by inclusion. The deepest part of the proof concerns the equivalence of perspectivity with "projectivity by decomposition"—of which a corollary is the transitivity of perspectivity." Additionally, "[I]n the general case, von Neumann proved the following basic representation theorem. Any complemented modular lattice L having a "basis" of n ≥ 4 pairwise perspective elements, is isomorphic with the lattice ℛ(R) of all principal right-ideals of a suitable regular ring R. This conclusion is the culmination of 140 pages of brilliant and incisive algebra involving entirely novel axioms. Anyone wishing to get an unforgettable impression of the razor edge of von Neumann's mind, need merely try to pursue this chain of exact reasoning for himself—realizing that often five pages of it were written down before breakfast, seated at a living room writing-table in a bathrobe." Von Neumann was the first to establish a rigorous mathematical framework for quantum mechanics, known as the Dirac–von Neumann axioms, with his 1932 work Mathematical Foundations of Quantum Mechanics. After having completed the axiomatization of set theory, he began to confront the axiomatization of quantum mechanics. He realized, in 1926, that a state of a quantum system could be represented by a point in a (complex) Hilbert space that, in general, could be infinite-dimensional even for a single particle. In this formalism of quantum mechanics, observable quantities such as position or momentum are represented as linear operators acting on the Hilbert space associated with the quantum system. The physics of quantum mechanics was thereby reduced to the mathematics of Hilbert spaces and linear operators acting on them. For example, the uncertainty principle, according to which the determination of the position of a particle prevents the determination of its momentum and vice versa, is translated into the non-commutativity of the two corresponding operators. This new mathematical formulation included as special cases the formulations of both Heisenberg and Schrödinger. When Heisenberg was informed von Neumann had clarified the difference between an unbounded operator that was a self-adjoint operator and one that was merely symmetric, Heisenberg replied "Eh? What is the difference?" Von Neumann's abstract treatment permitted him also to confront the foundational issue of determinism versus non-determinism, and in the book he presented a proof that the statistical results of quantum mechanics could not possibly be averages of an underlying set of determined "hidden variables," as in classical statistical mechanics. In 1935, Grete Hermann published a paper arguing that the proof contained a conceptual error and was therefore invalid. Hermann's work was largely ignored until after John S. Bell made essentially the same argument in 1966. However, in 2010, Jeffrey Bub argued that Bell had misconstrued von Neumann's proof, and pointed out that the proof, though not valid for all hidden variable theories, does rule out a well-defined and important subset. Bub also suggests that von Neumann was aware of this limitation, and that von Neumann did not claim that his proof completely ruled out hidden variable theories. The validity of Bub's argument is, in turn, disputed. In any case, Gleason's Theorem of 1957 fills the gaps in von Neumann's approach. Von Neumann's proof inaugurated a line of research that ultimately led, through the work of Bell in 1964 on Bell's theorem, and the experiments of Alain Aspect in 1982, to the demonstration that quantum physics either requires a notion of reality substantially different from that of classical physics, or must include nonlocality in apparent violation of special relativity. Though theories of quantum mechanics continue to evolve to this day, there is a basic framework for the mathematical formalism of problems in quantum mechanics which underlies the majority of approaches and can be traced back to the mathematical formalisms and techniques first used by von Neumann. In other words, discussions about interpretation of the theory, and extensions to it, are now mostly conducted on the basis of shared assumptions about the mathematical foundations. Many of the same entropy measures in classical information theory can also be generalized to the quantum case, such as Holevo entropy and the conditional quantum entropy. Quantum information theory is largely concerned with the interpretation and uses of von Neumann entropy. The von Neumann entropy is the cornerstone in the development of quantum information theory, while the Shannon entropy applies to classical information theory. This is considered a historical anomaly, as it might have been expected that Shannon entropy was discovered prior to Von Neumann entropy, given the latter's more widespread application to quantum information theory. However, the historical reverse occurred. Von Neumann first discovered von Neumann entropy, and applied it to questions of statistical physics. Decades later, Shannon developed an information-theoretic formula for use in classical information theory, and asked von Neumann what to call it, with von Neumman telling him to call it Shannon entropy, as it was a special case of von Neumann entropy. The formalism of density operators and matrices was introduced by von Neumann in 1927 and independently, but less systematically by Lev Landau and Felix Bloch in 1927 and 1946 respectively. The density matrix is an alternative way in which to represent the state of a quantum system, which could otherwise be represented using the wavefunction. The density matrix allows the solution of certain time-dependent problems in quantum mechanics. The von Neumann measurement scheme, the ancestor of quantum decoherence theory, represents measurements projectively by taking into account the measuring apparatus which is also treated as a quantum object. The 'projective measurement' scheme introduced by von Neumann, led to the development of quantum decoherence theories. , are not valid for quantum theory. As Hilary Putnam writes, von Neumann replaced classical logic with a logic constructed in orthomodular lattices (isomorphic to the lattice of subspaces of the Hilbert space of a given physical system). Von Neumann founded the field of game theory as a mathematical discipline. Von Neumann proved his minimax theorem in 1928. This theorem establishes that in zero-sum games with perfect information (i.e. in which players know at each time all moves that have taken place so far), there exists a pair of strategies for both players that allows each to minimize his maximum losses, hence the name minimax. When examining every possible strategy, a player must consider all the possible responses of his adversary. The player then plays out the strategy that will result in the minimization of his maximum loss. Such strategies, which minimize the maximum loss for each player, are called optimal. Von Neumann showed that their minimaxes are equal (in absolute value) and contrary (in sign). Von Neumann improved and extended the minimax theorem to include games involving imperfect information and games with more than two players, publishing this result in his 1944 Theory of Games and Economic Behavior (written with Oskar Morgenstern). Morgenstern wrote a paper on game theory and thought he would show it to von Neumann because of his interest in the subject. He read it and said to Morgenstern that he should put more in it. This was repeated a couple of times, and then von Neumann became a coauthor and the paper became 100 pages long. Then it became a book. The public interest in this work was such that The New York Times ran a front-page story. In this book, von Neumann declared that economic theory needed to use functional analytic methods, especially convex sets and topological fixed-point theorem, rather than the traditional differential calculus, because the maximum-operator did not preserve differentiable functions. Independently, Leonid Kantorovich's functional analytic work on mathematical economics also focused attention on optimization theory, non-differentiability, and vector lattices. Von Neumann's functional-analytic techniques—the use of duality pairings of real vector spaces to represent prices and quantities, the use of supporting and separating hyperplanes and convex sets, and fixed-point theory—have been the primary tools of mathematical economics ever since. along with two inequality systems expressing economic efficiency. In this model, the (transposed) probability vector p represents the prices of the goods while the probability vector q represents the "intensity" at which the production process would run. The unique solution λ represents the growth factor which is 1 plus the rate of growth of the economy; the rate of growth equals the interest rate. Von Neumann's results have been viewed as a special case of linear programming, where von Neumann's model uses only nonnegative matrices. The study of von Neumann's model of an expanding economy continues to interest mathematical economists with interests in computational economics. This paper has been called the greatest paper in mathematical economics by several authors, who recognized its introduction of fixed-point theorems, linear inequalities, complementary slackness, and saddlepoint duality. In the proceedings of a conference on von Neumann's growth model, Paul Samuelson said that many mathematicians had developed methods useful to economists, but that von Neumann was unique in having made significant contributions to economic theory itself. Von Neumann's famous 9-page paper started life as a talk at Princeton and then became a paper in German, which was eventually translated into English. His interest in economics that led to that paper began as follows: When lecturing at Berlin in 1928 and 1929 he spent his summers back home in Budapest, and so did the economist Nicholas Kaldor, and they hit it off. Kaldor recommended that von Neumann read a book by the mathematical economist Léon Walras. Von Neumann found some faults in that book and corrected them, for example, replacing equations by inequalities. He noticed that Walras's General Equilibrium Theory and Walras' Law, which led to systems of simultaneous linear equations, could produce the absurd result that the profit could be maximized by producing and selling a negative quantity of a product. He replaced the equations by inequalities, introduced dynamic equilibria, among other things, and eventually produced the paper. Building on his results on matrix games and on his model of an expanding economy, von Neumann invented the theory of duality in linear programming, after George Dantzig described his work in a few minutes, when an impatient von Neumann asked him to get to the point. Then, Dantzig listened dumbfounded while von Neumann provided an hour lecture on convex sets, fixed-point theory, and duality, conjecturing the equivalence between matrix games and linear programming. Later, von Neumann suggested a new method of linear programming, using the homogeneous linear system of Gordan (1873), which was later popularized by Karmarkar's algorithm. Von Neumann's method used a pivoting algorithm between simplices, with the pivoting decision determined by a nonnegative least squares subproblem with a convexity constraint (projecting the zero-vector onto the convex hull of the active simplex). Von Neumann's algorithm was the first interior point method of linear programming. Von Neumann made fundamental contributions to mathematical statistics. In 1941, he derived the exact distribution of the ratio of the mean square of successive differences to the sample variance for independent and identically normally distributed variables. This ratio was applied to the residuals from regression models and is commonly known as the Durbin–Watson statistic for testing the null hypothesis that the errors are serially independent against the alternative that they follow a stationary first order autoregression. Subsequently, Denis Sargan and Alok Bhargava extended the results for testing if the errors on a regression model follow a Gaussian random walk (i.e., possess a unit root) against the alternative that they are a stationary first order autoregression. Von Neumann made fundamental contributions in the field of fluid dynamics. Von Neumann's contributions to fluid dynamics included his discovery of the classic flow solution to blast waves, and the co-discovery (independently of Yakov Borisovich Zel'dovich and Werner Döring) of the ZND detonation model of explosives. During the 1930s, von Neumann became an authority on the mathematics of shaped charges. Later with Robert D. Richtmyer, von Neumann developed an algorithm defining artificial viscosity that improved the understanding of shock waves. When computers solved hydrodynamic or aerodynamic problems, they tried to put too many computational grid points at regions of sharp discontinuity (shock waves). The mathematics of artificial viscosity smoothed the shock transition without sacrificing basic physics. Von Neumann soon applied computer modelling to the field, developing software for his ballistics research. During WW2, he arrived one day at the office of R.H. Kent, the Director of the US Army's Ballistic Research Laboratory, with a computer program he had created for calculating a one-dimensional model of 100 molecules to simulate a shock wave. Von Neumann then gave a seminar on his computer program to an audience which included his friend Theodore von Kármán. After von Neumann had finished, von Kármán said "Well, Johnny, that's very interesting. Of course you realize Lagrange also used digital models to simulate continuum mechanics." It was evident from von Neumann's face, that he had been unaware of Lagrange's Mécanique analytique. An intuitive feeling for the combinatorial superstructure of new theories. Edward Teller wrote that "Nobody knows all science, not even von Neumann did. But as for mathematics, he contributed to every part of it except number theory and topology. That is, I think, something unique." Von Neumann was asked to write an essay for the layman describing what mathematics is, and produced a beautiful analysis. He explained that mathematics straddles the world between the empirical and logical, arguing that geometry was originally empirical, but Euclid constructed a logical, deductive theory. However, he argued, that there is always the danger of straying too far from the real world and becoming irrelevant sophistry. Beginning in the late 1930s, von Neumann developed an expertise in explosions—phenomena that are difficult to model mathematically. During this period, von Neumann was the leading authority of the mathematics of shaped charges. This led him to a large number of military consultancies, primarily for the Navy, which in turn led to his involvement in the Manhattan Project. The involvement included frequent trips by train to the project's secret research facilities at the Los Alamos Laboratory in a remote part of New Mexico. Von Neumann made his principal contribution to the atomic bomb in the concept and design of the explosive lenses that were needed to compress the plutonium core of the Fat Man weapon that was later dropped on Nagasaki. While von Neumann did not originate the "implosion" concept, he was one of its most persistent proponents, encouraging its continued development against the instincts of many of his colleagues, who felt such a design to be unworkable. He also eventually came up with the idea of using more powerful shaped charges and less fissionable material to greatly increase the speed of "assembly". When it turned out that there would not be enough uranium-235 to make more than one bomb, the implosive lens project was greatly expanded and von Neumann's idea was implemented. Implosion was the only method that could be used with the plutonium-239 that was available from the Hanford Site. He established the design of the explosive lenses required, but there remained concerns about "edge effects" and imperfections in the explosives. His calculations showed that implosion would work if it did not depart by more than 5% from spherical symmetry. After a series of failed attempts with models, this was achieved by George Kistiakowsky, and the construction of the Trinity bomb was completed in July 1945. In a visit to Los Alamos in September 1944, von Neumann showed that the pressure increase from explosion shock wave reflection from solid objects was greater than previously believed if the angle of incidence of the shock wave was between 90° and some limiting angle. As a result, it was determined that the effectiveness of an atomic bomb would be enhanced with detonation some kilometers above the target, rather than at ground level. Von Neumann, four other scientists, and various military personnel were included in the target selection committee that was responsible for choosing the Japanese cities of Hiroshima and Nagasaki as the first targets of the atomic bomb. Von Neumann oversaw computations related to the expected size of the bomb blasts, estimated death tolls, and the distance above the ground at which the bombs should be detonated for optimum shock wave propagation and thus maximum effect. The cultural capital Kyoto, which had been spared the bombing inflicted upon militarily significant cities, was von Neumann's first choice, a selection seconded by Manhattan Project leader General Leslie Groves. However, this target was dismissed by Secretary of War Henry L. Stimson. On July 16, 1945, von Neumann and numerous other Manhattan Project personnel were eyewitnesses to the first test of an atomic bomb detonation, which was code-named Trinity. The event was conducted as a test of the implosion method device, at the bombing range near Alamogordo Army Airfield, 35 miles (56 km) southeast of Socorro, New Mexico. Based on his observation alone, von Neumann estimated the test had resulted in a blast equivalent to 5 kilotons of TNT (21 TJ) but Enrico Fermi produced a more accurate estimate of 10 kilotons by dropping scraps of torn-up paper as the shock wave passed his location and watching how far they scattered. The actual power of the explosion had been between 20 and 22 kilotons. It was in von Neumann's 1944 papers that the expression "kilotons" appeared for the first time. After the war, Robert Oppenheimer remarked that the physicists involved in the Manhattan project had "known sin". Von Neumann's response was that "sometimes someone confesses a sin in order to take credit for it." Von Neumann continued unperturbed in his work and became, along with Edward Teller, one of those who sustained the hydrogen bomb project. He collaborated with Klaus Fuchs on further development of the bomb, and in 1946 the two filed a secret patent on "Improvement in Methods and Means for Utilizing Nuclear Energy", which outlined a scheme for using a fission bomb to compress fusion fuel to initiate nuclear fusion. The Fuchs–von Neumann patent used radiation implosion, but not in the same way as is used in what became the final hydrogen bomb design, the Teller–Ulam design. Their work was, however, incorporated into the "George" shot of Operation Greenhouse, which was instructive in testing out concepts that went into the final design. The Fuchs–von Neumann work was passed on to the Soviet Union by Fuchs as part of his nuclear espionage, but it was not used in the Soviets' own, independent development of the Teller–Ulam design. 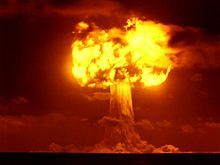 The historian Jeremy Bernstein has pointed out that ironically, "John von Neumann and Klaus Fuchs, produced a brilliant invention in 1946 that could have changed the whole course of the development of the hydrogen bomb, but was not fully understood until after the bomb had been successfully made." For his wartime services, von Neumann was awarded the Navy Distinguished Civilian Service Award in July 1946, and the Medal for Merit in October 1946. In 1950, von Neumann became a consultant to the Weapons Systems Evaluation Group (WSEG), whose function was to advise the Joint Chiefs of Staff and the United States Secretary of Defense on the development and use of new technologies. He also became an adviser to the Armed Forces Special Weapons Project (AFSWP), which was responsible for the military aspects on nuclear weapons. Over the following two years, he became a consultant to the Central Intelligence Agency (CIA), a member of the influential General Advisory Committee of the Atomic Energy Commission, a consultant to the newly established Lawrence Livermore National Laboratory, and a member of the Scientific Advisory Group of the United States Air Force. In 1955, von Neumann became a commissioner of the AEC. He accepted this position and used it to further the production of compact hydrogen bombs suitable for Intercontinental ballistic missile delivery. He involved himself in correcting the severe shortage of tritium and lithium 6 needed for these compact weapons, and he argued against settling for the intermediate-range missiles that the Army wanted. He was adamant that H-bombs delivered into the heart of enemy territory by an ICBM would be the most effective weapon possible, and that the relative inaccuracy of the missile wouldn't be a problem with an H-bomb. He said the Russians would probably be building a similar weapon system, which turned out to be the case. Despite his disagreement with Oppenheimer over the need for a crash program to develop the hydrogen bomb, he testified on the latter's behalf at the 1954 Oppenheimer security hearing, at which he asserted that Oppenheimer was loyal, and praised him for his helpfulness once the program went ahead. Shortly before his death from cancer, von Neumann headed the United States government's top secret ICBM committee, which would sometimes meet in his home. Its purpose was to decide on the feasibility of building an ICBM large enough to carry a thermonuclear weapon. Von Neumann had long argued that while the technical obstacles were sizable, they could be overcome in time. The SM-65 Atlas passed its first fully functional test in 1959, two years after his death. The feasibility of an ICBM owed as much to improved, smaller warheads as it did to developments in rocketry, and his understanding of the former made his advice invaluable. He modified the ENIAC by making it programmable and then wrote programs for it to do the H-bomb calculations verifying that the Teller-Ulam design was feasible and to develop it further. Through the Atomic Energy Commission, he promoted the development of a compact H-bomb that would fit in an ICBM. He personally interceded to speed up the production of lithium-6 and tritium needed for the compact bombs. He caused several separate missile projects to be started, because he felt that competition combined with collaboration got the best results. Von Neumann's assessment that the Soviets had a lead in missile technology, considered pessimistic at the time, was soon proven correct in the Sputnik crisis. Von Neumann entered government service primarily because he felt that, if freedom and civilization were to survive, it would have to be because the United States would triumph over totalitarianism from Nazism, Fascism and Soviet Communism. During a Senate committee hearing he described his political ideology as "violently anti-communist, and much more militaristic than the norm". He was quoted in 1950 remarking, "If you say why not bomb [the Soviets] tomorrow, I say, why not today? If you say today at five o'clock, I say why not one o'clock?" Dr. von Neumann, in a series of scientific study projects of major national significance, has materially increased the scientific progress of this country in the armaments field. Through his work on various highly classified missions performed outside the continental limits of the United States in conjunction with critically important international programs, Dr. von Neumann has resolved some of the most difficult technical problems of national defense. Von Neumann was a founding figure in computing. Von Neumann was the inventor, in 1945, of the merge sort algorithm, in which the first and second halves of an array are each sorted recursively and then merged. Von Neumann wrote the 23 pages long sorting program for the EDVAC in ink. On the first page, traces of the phrase "TOP SECRET", which was written in pencil and later erased, can still be seen. He also worked on the philosophy of artificial intelligence with Alan Turing when the latter visited Princeton in the 1930s. Von Neumann's hydrogen bomb work was played out in the realm of computing, where he and Stanisław Ulam developed simulations on von Neumann's digital computers for the hydrodynamic computations. During this time he contributed to the development of the Monte Carlo method, which allowed solutions to complicated problems to be approximated using random numbers. 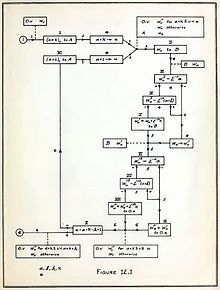 Flow chart from von Neumann's "Planning and coding of problems for an electronic computing instrument," published in 1947. Von Neumann's algorithm for simulating a fair coin with a biased coin is used in the "software whitening" stage of some hardware random number generators. Because using lists of "truly" random numbers was extremely slow, von Neumann developed a form of making pseudorandom numbers, using the middle-square method. Though this method has been criticized as crude, von Neumann was aware of this: he justified it as being faster than any other method at his disposal, writing that "Anyone who considers arithmetical methods of producing random digits is, of course, in a state of sin." Von Neumann also noted that when this method went awry it did so obviously, unlike other methods which could be subtly incorrect. While consulting for the Moore School of Electrical Engineering at the University of Pennsylvania on the EDVAC project, von Neumann wrote an incomplete First Draft of a Report on the EDVAC. The paper, whose premature distribution nullified the patent claims of EDVAC designers J. Presper Eckert and John Mauchly, described a computer architecture in which the data and the program are both stored in the computer's memory in the same address space. This architecture is the basis of most modern computer designs, unlike the earliest computers that were "programmed" using a separate memory device such as a paper tape or plugboard. Although the single-memory, stored program architecture is commonly called von Neumann architecture as a result of von Neumann's paper, the architecture was based on the work of Eckert and Mauchly, inventors of the ENIAC computer at the University of Pennsylvania. John von Neumann consulted for the Army's Ballistic Research Laboratory, most notably on the ENIAC project, as a member of its Scientific Advisory Committee. The electronics of the new ENIAC ran at one-sixth the speed, but this in no way degraded the ENIAC's performance, since it was still entirely I/O bound. Complicated programs could be developed and debugged in days rather than the weeks required for plugboarding the old ENIAC. Some of von Neumann's early computer programs have been preserved. The next computer that von Neumann designed was the IAS machine at the Institute for Advanced Study in Princeton, New Jersey. He arranged its financing, and the components were designed and built at the RCA Research Laboratory nearby. John von Neumann recommended that the IBM 701, nicknamed the defense computer, include a magnetic drum. It was a faster version of the IAS machine and formed the basis for the commercially successful IBM 704. Stochastic computing was first introduced in a pioneering paper by von Neumann in 1953. However, the theory could not be implemented until advances in computing of the 1960s. The first implementation of von Neumann's self-reproducing universal constructor. Three generations of machine are shown: the second has nearly finished constructing the third. The lines running to the right are the tapes of genetic instructions, which are copied along with the body of the machines. A simple configuration in von Neumann's cellular automaton. A binary signal is passed repeatedly around the blue wire loop, using excited and quiescent ordinary transmission states. A confluent cell duplicates the signal onto a length of red wire consisting of special transmission states. The signal passes down this wire and constructs a new cell at the end. This particular signal (1011) codes for an east-directed special transmission state, thus extending the red wire by one cell each time. During construction, the new cell passes through several sensitised states, directed by the binary sequence. Von Neumann's rigorous mathematical analysis of the structure of self-replication (of the semiotic relationship between constructor, description and that which is constructed), preceded the discovery of the structure of DNA. Von Neumann created the field of cellular automata without the aid of computers, constructing the first self-replicating automata with pencil and graph paper. The detailed proposal for a physical non-biological self-replicating system was first put forward in lectures von Neumann delivered in 1948 and 1949, when he first only proposed a kinematic self-reproducing automaton. While qualitatively sound, von Neumann was evidently dissatisfied with this model of a self-replicator due to the difficulty of analyzing it with mathematical rigor. He went on to instead develop a more abstract model self-replicator based on his original concept of cellular automata. Subsequently, the concept of the Von Neumann universal constructor based on the von Neumann cellular automaton was fleshed out in his posthumously published lectures Theory of Self Reproducing Automata. Ulam and von Neumann created a method for calculating liquid motion in the 1950s. The driving concept of the method was to consider a liquid as a group of discrete units and calculate the motion of each based on its neighbors' behaviors. Like Ulam's lattice network, von Neumann's cellular automata are two-dimensional, with his self-replicator implemented algorithmically. 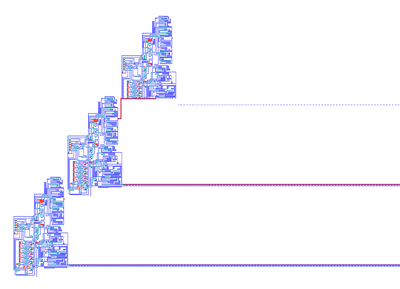 The result was a universal copier and constructor working within a cellular automaton with a small neighborhood (only those cells that touch are neighbors; for von Neumann's cellular automata, only orthogonal cells), and with 29 states per cell. Von Neumann gave an existence proof that a particular pattern would make infinite copies of itself within the given cellular universe by designing a 200,000 cell configuration that could do so. [T]here exists a critical size below which the process of synthesis is degenerative, but above which the phenomenon of synthesis, if properly arranged, can become explosive, in other words, where syntheses of automata can proceed in such a manner that each automaton will produce other automata which are more complex and of higher potentialities than itself. The cybernetics movement highlighted the question of what it takes for self-reproduction to occur autonomously, and in 1952, John von Neumann designed an elaborate 2D cellular automaton that would automatically make a copy of its initial configuration of cells. The von Neumann neighborhood, in which each cell in a two-dimensional grid has the four orthogonally adjacent grid cells as neighbors, continues to be used for other cellular automata. Von Neumann proved that the most effective way of performing large-scale mining operations such as mining an entire moon or asteroid belt would be by using self-replicating spacecraft, taking advantage of their exponential growth. Von Neumann investigated the question of whether modelling evolution on a digital computer could solve the complexity problem in programming. Beginning in 1949, von Neumann's design for a self-reproducing computer program is considered the world's first computer virus, and he is considered to be the theoretical father of computer virology. As part of his research into weather forecasting, von Neumann founded the "Meteorological Program" in Princeton in 1946, securing funding for his project from the US Navy. Von Neumann and his appointed assistant on this project, Jule Gregory Charney, wrote the world's first climate modelling software, and used it to perform the world's first numerical weather forecasts on the ENIAC computer; von Neumann and his team published the results as Numerical Integration of the Barotropic Vorticity Equation in 1950. Together they played a leading role in efforts to integrate sea-air exchanges of energy and moisture into the study of climate. Von Neumann proposed as the research program for climate modeling: "The approach is to first try short-range forecasts, then long-range forecasts of those properties of the circulation that can perpetuate themselves over arbitrarily long periods of time, and only finally to attempt forecast for medium-long time periods which are too long to treat by simple hydrodynamic theory and too short to treat by the general principle of equilibrium theory." Von Neumann's research into weather systems and meteorological prediction led him to propose manipulating the environment by spreading colorants on the polar ice caps to enhance absorption of solar radiation (by reducing the albedo), thereby inducing global warming. Von Neumann proposed a theory of global warming as a result of the activity of humans, noting that the Earth was only 6 °F (3.3 °C) colder during the last glacial period, he wrote in 1955: "Carbon dioxide released into the atmosphere by industry's burning of coal and oil - more than half of it during the last generation - may have changed the atmosphere's composition sufficiently to account for a general warming of the world by about one degree Fahrenheit." However, von Neumann urged a degree of caution in any program of intentional human weather manufacturing: "What could be done, of course, is no index to what should be done... In fact, to evaluate the ultimate consequences of either a general cooling or a general heating would be a complex matter. Changes would affect the level of the seas, and hence the habitability of the continental coastal shelves; the evaporation of the seas, and hence general precipitation and glaciation levels; and so on... But there is little doubt that one could carry out the necessary analyses needed to predict the results, intervene on any desired scale, and ultimately achieve rather fantastic results." "The technology that is now developing and that will dominate the next decades is in conflict with traditional, and, in the main, momentarily still valid, geographical and political units and concepts. This is a maturing crisis of technology... The most hopeful answer is that the human species has been subjected to similar tests before and it seems to have a congenital ability to come through, after varying amounts of trouble." The first use of the concept of a singularity in the technological context is attributed to von Neumann, who according to Ulam discussed the "ever accelerating progress of technology and changes in the mode of human life, which gives the appearance of approaching some essential singularity in the history of the race beyond which human affairs, as we know them, could not continue." This concept was fleshed out later in the book Future Shock by Alvin Toffler. Other mathematicians were stunned by von Neumann's ability to instantaneously perform complex operations in his head. As a six-year-old, he could divide two eight-digit numbers in his head and converse in Ancient Greek. When he was sent at the age of 15 to study advanced calculus under analyst Gábor Szegő, Szegő was so astounded with the boy's talent in mathematics that he was brought to tears on their first meeting. Nobel Laureate Hans Bethe said "I have sometimes wondered whether a brain like von Neumann's does not indicate a species superior to that of man", and later Bethe wrote that "[von Neumann's] brain indicated a new species, an evolution beyond man". Seeing von Neumann's mind at work, Eugene Wigner wrote, "one had the impression of a perfect instrument whose gears were machined to mesh accurately to a thousandth of an inch." Paul Halmos states that "von Neumann's speed was awe-inspiring." Israel Halperin said: "Keeping up with him was ... impossible. The feeling was you were on a tricycle chasing a racing car." Edward Teller admitted that he "never could keep up with him". Teller also said "von Neumann would carry on a conversation with my 3-year-old son, and the two of them would talk as equals, and I sometimes wondered if he used the same principle when he talked to the rest of us." Peter Lax wrote "Von Neumann was addicted to thinking, and in particular to thinking about mathematics". When George Dantzig brought von Neumann an unsolved problem in linear programming "as I would to an ordinary mortal", on which there had been no published literature, he was astonished when von Neumann said "Oh, that! ", before offhandedly giving a lecture of over an hour, explaining how to solve the problem using the hitherto unconceived theory of duality. Lothar Wolfgang Nordheim described von Neumann as the "fastest mind I ever met", and Jacob Bronowski wrote "He was the cleverest man I ever knew, without exception. He was a genius." George Pólya, whose lectures at ETH Zürich von Neumann attended as a student, said "Johnny was the only student I was ever afraid of. If in the course of a lecture I stated an unsolved problem, the chances were he'd come to me at the end of the lecture with the complete solution scribbled on a slip of paper." Eugene Wigner writes: "'Jancsi,' I might say, 'Is angular momentum always an integer of h?' He would return a day later with a decisive answer: 'Yes, if all particles are at rest.'... We were all in awe of Jancsi von Neumann". Enrico Fermi told physicist Herbert L. Anderson: "You know, Herb, Johnny can do calculations in his head ten times as fast as I can! And I can do them ten times as fast as you can, Herb, so you can see how impressive Johnny is!" Two bicyclists start 20 miles apart and head toward each other, each going at a steady rate of 10 mph. At the same time a fly that travels at a steady 15 mph starts from the front wheel of the southbound bicycle and flies to the front wheel of the northbound one, then turns around and flies to the front wheel of the southbound one again, and continues in this manner till he is crushed between the two front wheels. Question: what total distance did the fly cover? The slow way to find the answer is to calculate what distance the fly covers on the first, southbound, leg of the trip, then on the second, northbound, leg, then on the third, etc., etc., and, finally, to sum the infinite series so obtained. The quick way is to observe that the bicycles meet exactly one hour after their start, so that the fly had just an hour for his travels; the answer must therefore be 15 miles. When the question was put to von Neumann, he solved it in an instant, and thereby disappointed the questioner: "Oh, you must have heard the trick before!" "What trick?" asked von Neumann, "All I did was sum the geometric series." Eugene Wigner told a similar story, only with a swallow instead of a fly, and says it was Max Born who posed the question to von Neumann in the 1920s. One of his remarkable abilities was his power of absolute recall. As far as I could tell, von Neumann was able on once reading a book or article to quote it back verbatim; moreover, he could do it years later without hesitation. He could also translate it at no diminution in speed from its original language into English. On one occasion I tested his ability by asking him to tell me how A Tale of Two Cities started. Whereupon, without any pause, he immediately began to recite the first chapter and continued until asked to stop after about ten or fifteen minutes. Von Neumann was reportedly able to memorize the pages of telephone directories. He entertained friends by asking them to randomly call out page numbers; he then recited the names, addresses and numbers therein. "It seems fair to say that if the influence of a scientist is interpreted broadly enough to include impact on fields beyond science proper, then John von Neumann was probably the most influential mathematician who ever lived," wrote Miklós Rédei in John von Neumann: Selected Letters. James Glimm wrote: "he is regarded as one of the giants of modern mathematics". The mathematician Jean Dieudonné said that von Neumann "may have been the last representative of a once-flourishing and numerous group, the great mathematicians who were equally at home in pure and applied mathematics and who throughout their careers maintained a steady production in both directions", while Peter Lax described him as possessing the "most scintillating intellect of this century". In the foreword of Miklós Rédei's Selected Letters, Peter Lax wrote, "To gain a measure of von Neumann's achievements, consider that had he lived a normal span of years, he would certainly have been a recipient of a Nobel Prize in economics. And if there were Nobel Prizes in computer science and mathematics, he would have been honored by these, too. So the writer of these letters should be thought of as a triple Nobel laureate or, possibly, a ​3 1⁄2-fold winner, for his work in physics, in particular, quantum mechanics". In 1955, von Neumann was diagnosed with what was either bone or pancreatic cancer. He was not able to accept the proximity of his own demise, and the shadow of impending death instilled great fear in him. He invited a Roman Catholic priest, Father Anselm Strittmatter, O.S.B., to visit him for consultation. Von Neumann reportedly said, "So long as there is the possibility of eternal damnation for nonbelievers it is more logical to be a believer at the end", essentially saying that Pascal had a point, referring to Pascal's Wager. He had earlier confided to his mother, "There probably has to be a God. Many things are easier to explain if there is than if there isn't." Father Strittmatter administered the last rites to him. Some of von Neumann's friends (such as Abraham Pais and Oskar Morgenstern) said they had always believed him to be "completely agnostic". Of this deathbed conversion, Morgenstern told Heims, "He was of course completely agnostic all his life, and then he suddenly turned Catholic—it doesn't agree with anything whatsoever in his attitude, outlook and thinking when he was healthy." Father Strittmatter recalled that even after his conversion, von Neumann did not receive much peace or comfort from it, as he still remained terrified of death. Von Neumann was on his deathbed when he entertained his brother by reciting by heart and word-for-word the first few lines of each page of Goethe's Faust. He died at age 53 on February 8, 1957, at the Walter Reed Army Medical Center in Washington, D.C., under military security lest he reveal military secrets while heavily medicated. 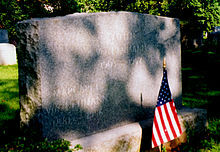 He was buried at Princeton Cemetery in Princeton, Mercer County, New Jersey. 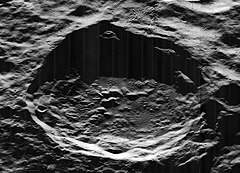 The von Neumann crater, on the far side of the Moon. The John von Neumann Theory Prize of the Institute for Operations Research and the Management Sciences (INFORMS, previously TIMS-ORSA) is awarded annually to an individual (or group) who have made fundamental and sustained contributions to theory in operations research and the management sciences. The IEEE John von Neumann Medal is awarded annually by the Institute of Electrical and Electronics Engineers (IEEE) "for outstanding achievements in computer-related science and technology." The John von Neumann Lecture is given annually at the Society for Industrial and Applied Mathematics (SIAM) by a researcher who has contributed to applied mathematics, and the chosen lecturer is also awarded a monetary prize. The crater von Neumann on the Moon is named after him. Asteroid 22824 von Neumann was named in his honor. The John von Neumann Center in Plainsboro Township, New Jersey, was named in his honor. 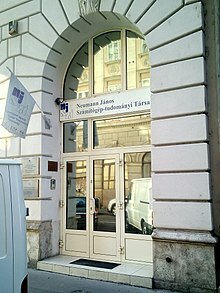 The professional society of Hungarian computer scientists, John von Neumann Computer Society, is named after John von Neumann. It was closed in April 1989. On May 4, 2005, the United States Postal Service issued the American Scientists commemorative postage stamp series, a set of four 37-cent self-adhesive stamps in several configurations designed by artist Victor Stabin. The scientists depicted were von Neumann, Barbara McClintock, Josiah Willard Gibbs, and Richard Feynman. The John von Neumann Award of the Rajk László College for Advanced Studies was named in his honor, and has been given every year since 1995 to professors who have made an outstanding contribution to the exact social sciences and through their work have strongly influenced the professional development and thinking of the members of the college. John von Neumann University was established in Hungary in 2016, as a successor to Kecskemét College. 1923. On the introduction of transfinite numbers, 346–54. 1925. An axiomatization of set theory, 393–413. 1932. Mathematical Foundations of Quantum Mechanics, Beyer, R. T., trans., Princeton Univ. Press. 1996 edition: ISBN 0-691-02893-1. 1937. von Neumann, John (1981). Halperin, Israel, ed. Continuous geometries with a transition probability. Memoirs of the American Mathematical Society. 34. ISBN 978-0-8218-2252-4. MR 0634656. 1944. Theory of Games and Economic Behavior, with Morgenstern, O., Princeton Univ. Press, online at archive.org. 2007 edition: ISBN 978-0-691-13061-3. 1948. "The general and logical theory of automata," in Cerebral Mechanisms in Behavior: The Hixon Symposium, Jeffress, L.A. ed., John Wiley & Sons, New York, N. Y, 1951, pp. 1–31, MR 0045446. 1960. von Neumann, John (1998). Continuous geometry. Princeton Landmarks in Mathematics. Princeton University Press. ISBN 978-0-691-05893-1. MR 0120174. ^ Dempster, M. A. H. (February 2011). "Benoit B. Mandelbrot (1924–2010): a father of Quantitative Finance" (PDF). Quantitative Finance. 11 (2): 155–156. doi:10.1080/14697688.2011.552332. ^ Rèdei 1999, p. 3. ^ a b c Dieudonné 2008, p. 90. ^ Doran et al. 2004, p. 8. ^ a b c Blair 1957, p. 104. ^ Doran et al. 2004, p. 1. ^ Myhrvold, Nathan (March 21, 1999). "John von Neumann". Time. ^ Dyson 1998, p. xxi. ^ Macrae 1992, pp. 38–42. ^ Macrae 1992, pp. 37–38. ^ Macrae 1992, p. 39. ^ Macrae 1992, pp. 44–45. ^ a b Macrae 1992, pp. 57–58. ^ Henderson 2007, p. 30. ^ Schneider, Gersting & Brinkman 2015, p. 28. ^ Mitchell 2009, p. 124. ^ Macrae 1992, pp. 46–47. ^ a b c d e f g Halmos, P. R. (1973). "The Legend of von Neumann". The American Mathematical Monthly. 80 (4): 382–394. doi:10.2307/2319080. JSTOR 2319080. ^ a b c d Blair 1957, p. 90. ^ Macrae 1992, p. 52. ^ a b c Macrae 1992, pp. 70–71. ^ Doran et al. 2004, p. 3. ^ Macrae 1992, pp. 32–33. ^ a b Glimm, Impagliazzo & Singer 1990, p. 5. ^ Nasar 2001, p. 81. ^ Macrae 1992, p. 84. ^ von Kármán, T., & Edson, L. (1967). The wind and beyond. Little, Brown & Company. ^ Macrae 1992, pp. 85–87. ^ Macrae 1992, p. 97. ^ a b Regis, Ed (November 8, 1992). "Johnny Jiggles the Planet". The New York Times. Retrieved February 4, 2008. ^ von Neumann, J. (1928). "Die Axiomatisierung der Mengenlehre". Mathematische Zeitschrift (in German). 27 (1): 669–752. doi:10.1007/BF01171122. ISSN 0025-5874. ^ Macrae 1992, pp. 86–87. ^ Macrae 1992, pp. 98–99. ^ Hashagen, Ulf (2010). "Die Habilitation von John von Neumann an der Friedrich-Wilhelms-Universität in Berlin: Urteile über einen ungarisch-jüdischen Mathematiker in Deutschland im Jahr 1927". Historia Mathematica. 37 (2): 242–280. doi:10.1016/j.hm.2009.04.002. ^ Macrae 1992, p. 145. ^ Macrae 1992, pp. 143–144. ^ a b Macrae 1992, pp. 155–157. ^ "Marina Whitman". The Gerald R. Ford School of Public Policy at the University of Michigan. 2014-07-18. Retrieved January 5, 2015. ^ Macrae 1992, pp. 170–174. ^ Bochner, S. (1958). "John von Neumann; A Biographical Memoir" (PDF). National Academy of Sciences. Retrieved August 16, 2015. ^ Macrae 1992, pp. 43, 157. ^ Macrae 1992, pp. 167–168. ^ Macrae 1992, p. 371. ^ Macrae 1992, pp. 195–196. ^ Macrae 1992, pp. 190–195. ^ Ulam 1983, p. 70. ^ Macrae 1992, pp. 170–171. ^ Regis 1987, p. 103. ^ a b "Conversation with Marina Whitman". Gray Watson (256.com). Archived from the original on April 28, 2011. Retrieved January 30, 2011. ^ Poundstone, William (May 4, 2012). "Unleashing the Power". The New York Times. ^ Macrae 1992, p. 150. ^ Macrae 1992, p. 48. ^ a b Blair 1957, p. 94. ^ Stern, Nancy (January 20, 1981). "An Interview with Cuthbert C. Hurd" (PDF). Charles Babbage Institute, University of Minnesota. Retrieved June 3, 2010. ^ Rota 1989, pp. 26–27. ^ Macrae 1992, p. 75. ^ a b c d Van Heijenoort 1967, pp. 393–394. ^ Macrae 1992, pp. 104–105. ^ a b von Neumann 2005, p. 123. ^ Dawson 1997, p. 70. ^ von Neumann 2005, p. 124. ^ Macrae 1992, p. 182. ^ Two famous papers are: von Neumann, John (1932). "Proof of the Quasi-ergodic Hypothesis". Proc Natl Acad Sci USA. 18 (1): 70–82. Bibcode:1932PNAS...18...70N. doi:10.1073/pnas.18.1.70. PMC 1076162. PMID 16577432. . von Neumann, John (1932). "Physical Applications of the Ergodic Hypothesis". Proc Natl Acad Sci USA. 18 (3): 263–266. Bibcode:1932PNAS...18..263N. doi:10.1073/pnas.18.3.263. JSTOR 86260. PMC 1076204. PMID 16587674. . Hopf, Eberhard (1939). "Statistik der geodätischen Linien in Mannigfaltigkeiten negativer Krümmung". Leipzig Ber. Verhandl. Sächs. Akad. Wiss. 91: 261–304. ^ a b c d e f Halmos, Paul R. (1958). "Von Neumann on measure and ergodic theory" (PDF). Bull. Amer. Math. Soc. 64 (3, Part 2): 86–94. doi:10.1090/S0002-9904-1958-10203-7. ^ Petz & Redi 1995, pp. 163–181. ^ "Von Neumann Algebras" (PDF). Princeton University. Retrieved January 6, 2016. ^ "Direct Integrals of Hilbert Spaces and von Neumann Algebras" (PDF). University of California at Los Angeles. Archived from the original (PDF) on 2015-07-02. Retrieved January 6, 2016. ^ a b c Van Hove, Léon (1958). "Von Neumann's Contributions to Quantum Theory". Bulletin of the American Mathematical Society. 64 (3): 95–99. doi:10.1090/s0002-9904-1958-10206-2. ^ von Neumann, J. (1933). "Die Einfuhrung Analytischer Parameter in Topologischen Gruppen". Annals of Mathematics. 2. 34 (1): 170–179. doi:10.2307/1968347. JSTOR 1968347. ^ "AMS Bôcher Prize". AMS. January 5, 2016. Retrieved 2018-01-12. ^ Macrae 1992, p. 140. ^ von Neumann, John (1930). "Zur Algebra der Funktionaloperationen und Theorie der normalen Operatoren". Mathematische Annalen (in German). 102 (1): 370–427. Bibcode:1930MatAn.102..685E. doi:10.1007/BF01782352. . The original paper on von Neumann algebras. ^ a b c Birkhoff, Garrett (1958). Von Neumann and lattice theory (PDF). Bulletin of the American Mathematical Society. 64. pp. 50–56. doi:10.1090/S0002-9904-1958-10192-5. ISBN 978-0-8218-1025-5. ^ a b Macrae 1992, pp. 139–141. ^ Macrae 1992, p. 142. ^ Hermann, Grete (1935). "Die naturphilosophischen Grundlagen der Quantenmechanik". Naturwissenschaften. 23 (42): 718–721. Bibcode:1935NW.....23..718H. doi:10.1007/BF01491142. English translation in Hermann, Grete (2016). Crull, Elise; Bacciagaluppi, Guido, eds. Grete Hermann — Between physics and philosophy. Springer. pp. 239–278. ^ Bell, John S. (1966). "On the problem of hidden variables in quantum mechanics". Reviews of Modern Physics. 38 (3): 447–452. Bibcode:1966RvMP...38..447B. doi:10.1103/RevModPhys.38.447. ^ Bub, Jeffrey (2010). "Von Neumann's 'No Hidden Variables' Proof: A Re-Appraisal". Foundations of Physics. 40 (9–10): 1333–1340. arXiv:1006.0499. Bibcode:2010FoPh...40.1333B. doi:10.1007/s10701-010-9480-9. ^ Mermin, N. David; Schack, Rüdiger (2018). "Homer nodded: von Neumann's surprising oversight". Foundations of Physics. 48 (9): 1007–1020. arXiv:1805.10311. Bibcode:2018FoPh...48.1007M. doi:10.1007/s10701-018-0197-5. ^ Freire, Olival Jr. (2006). "Philosophy enters the optics laboratory: Bell's theorem and its first experimental tests (1965–1982)". Studies in History and Philosophy of Modern Physics. 37 (4): 577–616. arXiv:physics/0508180. Bibcode:2006SHPMP..37..577F. doi:10.1016/j.shpsb.2005.12.003. ^ Wigner, Eugene; Henry Margenau (December 1967). "Remarks on the Mind Body Question, in Symmetries and Reflections, Scientific Essays". American Journal of Physics. 35 (12): 1169–1170. Bibcode:1967AmJPh..35.1169W. doi:10.1119/1.1973829. ^ Schlosshauer, M.; Koer, J.; Zeilinger, A. (2013). "A Snapshot of Foundational Attitudes Toward Quantum Mechanics". Studies in History and Philosophy of Science Part B: Studies in History and Philosophy of Modern Physics. 44 (3): 222–230. arXiv:1301.1069. Bibcode:2013SHPMP..44..222S. doi:10.1016/j.shpsb.2013.04.004. ^ a b Schreiber, Z. The Nine Lives of Schrödingers's Cat. ^ Nielsen, Michael A. and Isaac Chuang (2001). Quantum computation and quantum information (Repr. ed.). Cambridge [u.a. ]: Cambridge Univ. Press. p. 700. ISBN 978-0-521-63503-5. ^ Gabbay, Dov M.; Woods, John (2007). "The History of Quantum Logic". 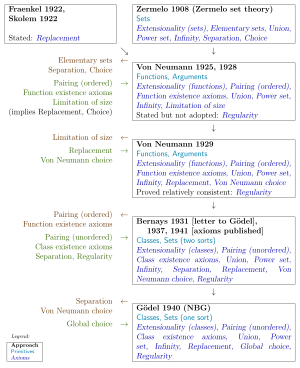 The Many Valued and Nonmonotonic Turn in Logic. Elsevier. pp. 205–2017. ISBN 978-0-08-054939-2. ^ a b Birkhoff, Garrett; von Neumann, John (October 1936). "The Logic of Quantum Mechanics". Annals of Mathematics. 37 (4): 823–843. doi:10.2307/1968621. JSTOR 1968621. ^ Putnam, Hilary (1985). Philosophical Papers: Volume 3, Realism and Reason. Cambridge University Press. p. 263. ISBN 978-0-521-31394-0. ^ a b c Kuhn, H. W.; Tucker, A. W. (1958). "John von Neumann's work in the theory of games and mathematical economics". Bull. Amer. Math. Soc. 64 (Part 2) (3): 100–122. CiteSeerX 10.1.1.320.2987. doi:10.1090/s0002-9904-1958-10209-8. MR 0096572. ^ von Neumann, J: (1928). "Zur Theorie der Gesellschaftsspiele". Mathematische Annalen (in German). 100 (1928): 295–320. Bibcode:1928MatAn.100...32C. doi:10.1007/bf01448847. where the nonnegative matrix A must be square and where the diagonal matrix I is the identity matrix. Von Neumann's irreducibility condition was called the "whales and wranglers" hypothesis by David Champernowne, who provided a verbal and economic commentary on the English translation of von Neumann's article. Von Neumann's hypothesis implied that every economic process used a positive amount of every economic good. Weaker "irreducibility" conditions were given by David Gale and by John Kemeny, Oskar Morgenstern, and Gerald L. Thompson in the 1950s and then by Stephen M. Robinson in the 1970s. ^ Morgenstern & Thompson 1976, pp. xviii, 277. ^ Rockafellar 1970, pp. i, 74. ^ Rockafellar 1974, pp. 351–378. ^ Ye 1997, pp. 277–299. ^ Bruckmann, Gerhart; Weber, Wilhelm, eds. (September 21, 1971). Contributions to von Neumann's Growth Model. Proceedings of a Conference Organized by the Institute for Advanced Studies Vienna, Austria, July 6 and 7, 1970. Springer–Verlag. doi:10.1007/978-3-662-24667-2. ISBN 978-3-662-22738-1. ^ Macrae 1992, pp. 250–253. ^ a b Dantzig, George; Thapa, Mukund N. (2003). Linear Programming : 2: Theory and Extensions. New York, NY: Springer-Verlag. ISBN 978-1-4419-3140-5. ^ von Neumann, John (1941). "Distribution of the ratio of the mean square successive difference to the variance". Annals of Mathematical Statistics. 12 (4): 367–395. doi:10.1214/aoms/1177731677. JSTOR 2235951. ^ a b Durbin, J.; Watson, G. S. (1950). "Testing for Serial Correlation in Least Squares Regression, I". Biometrika. 37 (3–4): 409–428. doi:10.2307/2332391. JSTOR 2332391. PMID 14801065. ^ Sargan, J.D. ; Bhargava, Alok (1983). "Testing residuals from least squares regression for being generated by the Gaussian random walk". Econometrica. 51 (1): 153–174. doi:10.2307/1912252. JSTOR 1912252. ^ von Neumann 1963a, pp. 219–237. ^ von Neumann 1963b, pp. 205–218. ^ von Neumann, J.; Richtmyer, R. D. (March 1950). "A Method for the Numerical Calculation of Hydrodynamic Shocks". Journal of Applied Physics. 21 (3): 232–237. Bibcode:1950JAP....21..232V. doi:10.1063/1.1699639. ^ Metropolis, Nicholas, ed. (2014). A History of Computing in the Twentieth Century. Elsevier. p. 24. ISBN 978-1-4832-9668-5. ^ Ulam 1983, p. 96. ^ Dyson 1998, p. 77. ^ "Von Neumann: The Mathematician". MacTutor History of Mathematics Archive. Retrieved December 16, 2016. ^ "Von Neumann: The Mathematician, Part 2". MacTutor History of Mathematics Archive. Retrieved December 16, 2016. ^ von Neumann 1947, pp. 180–196. ^ Hoddeson et al. 1993, pp. 130–133, 157–159. ^ Hoddeson et al. 1993, pp. 239–245. ^ Sublette, Carey. "Section 8.0 The First Nuclear Weapons". Nuclear Weapons Frequently Asked Questions. Retrieved January 8, 2016. ^ Hoddeson et al. 1993, pp. 320–327. ^ Macrae 1992, p. 209. ^ Hoddeson et al. 1993, p. 184. ^ Macrae 1992, pp. 242–245. ^ Groves 1962, pp. 268–276. ^ Hoddeson et al. 1993, pp. 371–372. ^ Macrae 1992, p. 205. ^ Macrae 1992, p. 245. ^ Herken 2002, pp. 171, 374. ^ a b Bernstein, Jeremy (2010). "John von Neumann and Klaus Fuchs: an Unlikely Collaboration". Physics in Perspective. 12 (1): 36–50. Bibcode:2010PhP....12...36B. doi:10.1007/s00016-009-0001-1. ^ Macrae 1992, p. 208. ^ a b Macrae 1992, pp. 350–351. ^ "Weapons' Values to be Appraised". Spokane Daily Chronicle. December 15, 1948. Retrieved January 8, 2015. ^ Heims 1980, p. 276. ^ Macrae 1992, pp. 367–369. ^ Macrae 1992, pp. 359–365. ^ Macrae 1992, pp. 362–363. ^ Heims 1980, pp. 258–260. ^ Macrae 1992, pp. 362–364. ^ Blair 1957, p. 96. ^ "Dwight D. Eisenhower: Citation Accompanying Medal of Freedom Presented to Dr. John von Neumann". The American Presidency Project. ^ Goldstine 1980, pp. 167–178. ^ Knuth 1998, p. 159. ^ a b Knuth, Donald E. (1987). "Von Neumann's First Computer Program". In Aspray, W.; Burks, A. Papers of John von Neumann on computing and computer theory. Cambridge: MIT Press. pp. 89–95. ISBN 978-0-262-22030-9. ^ Macrae 1992, pp. 183–184. ^ Macrae 1992, pp. 334–335. ^ von Neumann, John (1951). "Various techniques used in connection with random digits". National Bureau of Standards Applied Math Series. 12: 36. ^ a b Von Neumann, John (1951). "Various techniques used in connection with random digits" (PDF). National Bureau of Standards Applied Mathematics Series. 12: 36–38. ^ "John W. Mauchly and the Development of the ENIAC Computer". University of Pennsylvania. Retrieved January 27, 2017. ^ Macrae 1992, pp. 279–283. ^ "BRL's Scientific Advisory Committee, 1940". U.S. Army Research Laboratory. Retrieved 2018-01-12. ^ Knuth, Donald E. (1996). Selected papers on computer science (Center for the Study of Language and Information – Lecture Notes). Stanford, Calif. Cambridge, Mass. : CSLI Publications Cambridge University Press. ISBN 978-1-881526-91-9. ^ Rédei, Miklós (ed.). "Letter to R. S. Burlington.". John Von Neumann: Selected Letters. The American Mathematics Society and The London Mathematical Society. pp. 73 ff. ISBN 978-0-8218-9126-1. ^ Dyson 2012, pp. 267–268, 287. ^ von Neumann, John (1995). "Probabilistic logics and the synthesis of reliable organisms from unreliable components". In Bródy, F.; Vámos, Tibor. The Neumann Compendium. World Scientific. pp. 567–616. ISBN 978-981-02-2201-7. ^ Petrovic, R.; Siljak, D. (1962). "Multiplication by means of coincidence". ACTES Proc. of 3rd Int. Analog Comp. Meeting. ^ Afuso, C. (1964). "Quart. Tech. Prog. Rept". Department of Computer Science, University of Illinois at Urbana-Champaign, Illinois. ^ Rocha (2015), pp. 25–27. ^ von Neumann, John (1966). A. Burks, ed. The Theory of Self-reproducing Automata. Urbana, IL: Univ. of Illinois Press. ISBN 978-0-598-37798-2. ^ "2.1 Von Neumann's Contributions". Molecularassembler.com. Retrieved 2009-09-16. ^ "2.1.3 The Cellular Automaton (CA) Model of Machine Replication". Molecularassembler.com. Retrieved 2009-09-16. ^ a b c von Neumann, John (1966). Arthur W. Burks, ed. Theory of Self-Reproducing Automata (PDF) (PDF). Urbana and London: University of Illinois Press. ISBN 978-0-598-37798-2. ^ Freitas, Robert A., Jr. (1980). "A Self-Reproducing Interstellar Probe". Journal of the British Interplanetary Society. 33: 251–264. Bibcode:1980JBIS...33..251F. Retrieved January 9, 2015. ^ Filiol 2005, pp. 19–38. ^ Charney, J. G.; Fjörtoft, R.; Neumann, J. (1950). "Numerical Integration of the Barotropic Vorticity Equation". Tellus. 2 (4): 237–254. Bibcode:1950TellA...2..237C. doi:10.1111/j.2153-3490.1950.tb00336.x. ^ Gilchrist, Bruce, "Remembering Some Early Computers, 1948-1960" (PDF). Archived from the original on December 12, 2006. Retrieved 2006-12-12. CS1 maint: BOT: original-url status unknown (link), Columbia University EPIC, 2006, pp.7-9. (archived 2006) Contains some autobiographical material on Gilchrist's use of the IAS computer beginning in 1952. ^ a b Macrae 1992, p. 332. ^ a b Heims 1980, pp. 236–247. ^ Macrae 1992, p. 16. ^ Chalmers, David (2010). "The singularity: a philosophical analysis". Journal of Consciousness Studies. 17 (9–10): 7–65. ^ a b Goldstine 1980, pp. 171. ^ Macrae 1992, p. backcover. ^ Wigner, Mehra & Wightman 1995, p. 129. ^ Kaplan, Michael and Kaplan, Ellen (2006) Chances are–: adventures in probability. Viking. ^ Teller, Edward (April 1957). "John von Neumann". Bulletin of the Atomic Scientists. 13 (4): 150–151. ^ Nowak, Amram (1 January 1966). "John Von Neumann a documentary". Mathematical Association of America, Committee on Educational Media. OCLC 177660043. , DVD version (2013) OCLC 897933992. ^ Glimm, Impagliazzo & Singer 1990. ^ Mirowski 2002, p. 258. ^ Bronowski 1974, p. 433. ^ Petković 2009, p. 157. ^ "Fly Puzzle (Two Trains Puzzle)". Mathworld.wolfram.com. February 15, 2014. Retrieved February 25, 2014. ^ "John von Neumann – A Documentary". The Mathematical Association of American. 1966. pp. 16m46s–19m04s. Retrieved 22 February 2016. ^ Goldstine 1980, pp. 167. ^ von Neumann 2005, p. 7. ^ Glimm, Impagliazzo & Singer 1990, p. vii. ^ Glimm, Impagliazzo & Singer 1990, p. 7. ^ von Neumann 2005, p. xiii. ^ While there is a general agreement that the initially discovered bone tumour was a secondary growth, sources differ as to the location of the primary cancer. While Macrae gives it as pancreatic, the Life magazine article says it was prostate. ^ Read, Colin (2012). The Portfolio Theorists: von Neumann, Savage, Arrow and Markowitz. Great Minds in Finance. Palgrave Macmillan. p. 65. ISBN 978-0230274143. Retrieved September 29, 2017. When von Neumann realised he was incurably ill his logic forced him to realise that he would cease to exist... [a] fate which appeared to him unavoidable but unacceptable. ^ Macrae 1992, p. 379"
^ a b Dransfield & Dransfield 2003, p. 124 "He was brought up in a Hungary in which anti-Semitism was commonplace, but the family were not overly religious, and for most of his adult years von Neumann held agnostic beliefs." ^ Ayoub 2004, p. 170 "On the other hand, von Neumann, giving in to Pascal's wager on his death bed, received extreme unction." ^ Pais 2006, p. 109 "He had been completely agnostic for as long as I had known him. As far as I could see this act did not agree with the attitudes and thoughts he had harbored for nearly all his life." ^ a b Poundstone 1993, p. 194. ^ Macrae 1992, p. 380. ^ "John von Neumann Theory Prize". Institute for Operations Research and the Management Sciences. Archived from the original on May 13, 2016. Retrieved May 17, 2016. ^ "IEEE John von Neumann Medal". Institute of Electrical and Electronics Engineers. Retrieved May 17, 2016. ^ "The John von Neumann Lecture". Society for Industrial and Applied Mathematics. Retrieved May 17, 2016. ^ "Von Neumann". United States Geological Survey. Retrieved May 17, 2016. ^ "22824 von Neumann (1999 RP38)". Jet Propulsion Laboratory. Retrieved February 13, 2018. ^ "(22824) von Neumann = 1999 RP38 = 1998 HR2". Minor Planet Center. Retrieved February 13, 2018. ^ Anderson, Christopher (November 27, 1989). "NSF Supercomputer Program Looks Beyond Princeton Recall". The Scientist Magazine. Retrieved May 17, 2016. ^ "Introducing the John von Neumann Computer Society". John von Neumann Computer Society. Archived from the original on April 29, 2008. Retrieved May 20, 2008. ^ Kent & Williams 1994, p. 321. ^ "American Scientists Issue". Smithsonian National Postal Museum. Retrieved May 17, 2016. ^ "John von Neumann Award". díjaink – Rajk. Retrieved May 17, 2016. ^ a b John von Neumann at the Mathematics Genealogy Project. Retrieved March 17, 2015. Ayoub, Raymond George (2004). Musings Of The Masters: An Anthology Of Mathematical Reflections. Washington, D.C.: MAA. ISBN 978-0-88385-549-2. OCLC 56537093. Blair, Clay, Jr. (February 25, 1957). "Passing of a Great Mind". Life: 89–104. Blume, Lawrence E. (2008). "Convexity". In Durlauf, Steven N.; Blume, Lawrence E. The New Palgrave Dictionary of Economics (Second ed.). New York: Palgrave Macmillan. pp. 225–226. doi:10.1057/9780230226203.0315. ISBN 978-0-333-78676-5. Bronowski, Jacob (1974). The Ascent of Man. Boston: Little, Brown. ISBN 978-0-316-56940-8. OCLC 763593. Dawson, John W., Jr. (1997). Logical Dilemmas: The Life and Work of Kurt Gödel. Wellesley, Massachusetts: A. K. Peters. ISBN 978-1-56881-256-4. Dieudonné, J. (2008). "Von Neumann, Johann (or John)". In Gillispie, C. C. Complete Dictionary of Scientific Biography. 14 (7th ed.). Detroit: Charles Scribner's Sons. pp. 88–92 Gale Virtual Reference Library. ISBN 978-0-684-31559-1. OCLC 187313311. Doran, Robert S.; von Neumann, John; Stone, Marshall Harvey; Kadison, Richard V. (2004). Operator Algebras, Quantization, and Noncommutative Geometry: A Centennial Celebration Honoring John von Neumann and Marshall H. Stone. Washington, D.C.: American Mathematical Society. ISBN 978-0-8218-3402-2. Dransfield, Robert; Dransfield, Don (2003). Key Ideas in Economics. Cheltenham: Nelson Thornes. ISBN 978-0-7487-7081-6. OCLC 52395899. Dyson, George (1998). Darwin among the machines the evolution of global intelligence. Cambridge, Massachusetts: Perseus Books. ISBN 978-0-7382-0030-9. OCLC 757400572. Dyson, George (2012). Turing's Cathedral: the Origins of the Digital Universe. New York: Pantheon Books. ISBN 978-0-375-42277-5. OCLC 745979775. Filiol, Éric (2005). Computer viruses: from theory to applications, Volume 1. New York: Springer. pp. 9–38. ISBN 978-2-287-23939-7. OCLC 224779290. Glimm, James; Impagliazzo, John; Singer, Isadore Manuel (1990). The Legacy of John von Neumann. American Mathematical Society. ISBN 978-0-8218-4219-5. Goldstine, Herman (1980). The Computer from Pascal to von Neumann. Princeton University Press. ISBN 978-0-691-02367-0. Groves, Leslie (1962). Now it Can be Told: The Story of the Manhattan Project. New York: Harper & Row. ISBN 978-0-306-70738-4. OCLC 537684. Heims, Steve J. (1980). John von Neumann and Norbert Wiener, from Mathematics to the Technologies of Life and Death. Cambridge, Massachusetts: MIT Press. ISBN 978-0-262-08105-4. Henderson, Harry (2007). Mathematics: Powerful Patterns Into Nature and Society. New York: Chelsea House. ISBN 978-0-8160-5750-4. OCLC 840438801. Herken, Gregg (2002). Brotherhood of the Bomb: The Tangled Lives and Loyalties of Robert Oppenheimer, Ernest Lawrence, and Edward Teller. New York, New York: Holt Paperbacks. ISBN 978-0-8050-6589-3. OCLC 48941348. Kent, Allen; Williams, James G., eds. (1994). Encyclopedia of Computer Science and Technology, Volume=30, Supplement 15. New York: Dekker. ISBN 978-0-8247-2283-8. OCLC 832033269. Knuth, Donald (1998). The Art of Computer Programming: Volume 3 Sorting and Searching. Boston: Addison-Wesley. ISBN 978-0-201-89685-5. Macrae, Norman (1992). John von Neumann: The Scientific Genius Who Pioneered the Modern Computer, Game Theory, Nuclear Deterrence, and Much More. Pantheon Press. ISBN 978-0-679-41308-0. Mirowski, Philip (2002). Machine Dreams: Economics Becomes a Cyborg Science. New York: Cambridge University Press. ISBN 978-0-521-77283-9. OCLC 45636899. Mitchell, Melanie (2009). Complexity: A Guided Tour. New York: Oxford University Press. ISBN 978-0-19-512441-5. OCLC 216938473. Morgenstern, Oskar; Thompson, Gerald L. (1976). Mathematical Theory of Expanding and Contracting Economies. Lexington Books. Lexington, Massachusetts: D. C. Heath and Company. ISBN 978-0-669-00089-4. Nasar, Sylvia (2001). A Beautiful Mind : a Biography of John Forbes Nash, Jr., Winner of the Nobel Prize in Economics, 1994. London: Simon & Schuster. ISBN 978-0-7432-2457-4. Pais, Abraham (2006). J. Robert Oppenheimer: A Life. Oxford: Oxford University Press. ISBN 978-0-19-516673-6. OCLC 475574884. Petz, D.; Redi, M. R. (1995). "John von Neumann And The Theory Of Operator Algebras". The Neumann Compendium. Singapore: World Scientific. ISBN 978-981-02-2201-7. OCLC 32013468. Petković, Miodrag (2009). Famous puzzles of great mathematicians. American Mathematical Society. p. 157. ISBN 978-0-8218-4814-2. Poundstone, William (1993). Prisoner's Dilemma. Random House Digital. ISBN 978-0-385-41580-4. Rèdei, Miklos (1999). "Unsolved problems in mathematics". Mathematical Intelligencer: 7–12. Regis, Ed (1987). Who Got Einstein's Office? : Eccentricity and Genius at the Institute for Advanced Study. Reading, Massachusetts: Addison-Wesley. ISBN 978-0-201-12065-3. OCLC 15548856. Rocha, L.M. (2015). "Von Neumann and Natural Selection". Lecture Notes of I-585-Biologically Inspired Computing Course, Indiana University (PDF). Retrieved February 6, 2016. Rockafellar, R. T. (1974). "Convex Algebra and Duality in Dynamic Models of production". In Loz, Josef; Loz, Maria. Mathematical Models in Economics (Proc. Sympos. and Conf. von Neumann Models, Warsaw, 1972). Amsterdam: Elsevier North-Holland Publishing and Polish Academy of Sciences (PAN). OCLC 839117596. Rockafellar, R. T. (1970). Convex analysis. Princeton, New Jersey: Princeton University Press. ISBN 978-0-691-08069-7. OCLC 64619. Rota, Gian-Carlo (1989). "The Lost Cafe". In Cooper, Necia Grant; Eckhardt, Roger; Shera, Nancy. From Cardinals To Chaos: Reflections On The Life And Legacy Of Stanisław Ulam. Cambridge: Cambridge University Press. pp. 23–32. ISBN 978-0-521-36734-9. OCLC 18290810. Schneider, G. Michael; Gersting, Judith; Brinkman, Bo (2015). Invitation to Computer Science. Boston: Cengage Learning. ISBN 978-1-305-07577-1. OCLC 889643614. Ulam, Stanisław (1983). Adventures of a Mathematician. New York: Charles Scribner's Sons. ISBN 978-0-684-14391-0. OCLC 1528346. Van Heijenoort, Jean (1967). From Frege to Gödel: a Source Book in Mathematical Logic, 1879–1931. Cambridge, Massachusetts: Harvard University Press. ISBN 978-0-674-32450-3. OCLC 523838.
von Neumann, John (1947). Heywood, Robert B., ed. The Works of the Mind: The Mathematician. Chicago: University of Chicago Press. OCLC 752682744.
von Neumann, John (1963a). "The Point Source Solution". In Taub, A. H. John von Neumann. Collected Works, 1903–1957, Volume 6: Theory of Games, Astrophysics, Hydrodynamics and Meteorology Elmsford, New York. Pergamon Press. pp. 219–237. ISBN 978-0-08-009566-0. OCLC 493423386.
von Neumann, John (1963b) [1st pub. April 1, 1942]. "Theory of Detonation Waves. Progress Report to the National Defense Research Committee Div. B, OSRD-549". In Taub, A. H. John von Neumann: Collected Works, 1903–1957, Volume 6: Theory of Games, Astrophysics, Hydrodynamics and Meteorology (PDF). New York: Pergamon Press. pp. 205–218. ISBN 978-0-08-009566-0. OCLC 493423386. Retrieved 19 May 2016.
von Neumann, John (2005). Rédei, Miklós, ed. John von Neumann: Selected letters. History of Mathematics. 27. American Mathematical Society. ISBN 978-0-8218-3776-4. Wigner, Eugene Paul; Mehra, Jagdish; Wightman, A. S. (1995). Volume 7, Part B, Philosophical Reflections and Syntheses. Berlin: Springer. ISBN 978-3-540-63372-3. Ye, Yinyu (1997). "The von Neumann growth model". Interior point algorithms: Theory and analysis. New York: Wiley. pp. 277–299. ISBN 978-0-471-17420-2. OCLC 36746523. Aspray, William (1990). John von Neumann and the Origins of Modern Computing. Cambridge, Massachusetts: MIT Press. Bibcode:1990jvno.book.....A. ISBN 978-0-262-01121-1. OCLC 21524368. Dore, Mohammed; Sukhamoy, Chakravarty; Goodwin, Richard, eds. (1989). John Von Neumann and modern economics. Oxford: Clarendon. ISBN 978-0-19-828554-0. OCLC 18520691. Halmos, Paul R. (1985). I Want To Be A Mathematician: an Automathography. New York: Springer-Verlag. ISBN 978-0-387-96078-4. OCLC 11497873. Israel, Giorgio; Ana Millan Gasca (2009). The World as a Mathematical Game: John von Neumann, Twentieth Century Scientist. Birkhäuser: Basel. ISBN 978-3-7643-9896-5. OCLC 318641638.
von Neumann Whitman, Marina (2012). The Martian's Daughter—A Memoir. Anne Arbor: University of Michigan Press. ISBN 978-0-472-03564-9. OCLC 844308382. Redei, Miklos, ed. (2005). John von Neumann: Selected Letters. Providence, Rhode Island: American Mathematical Society. ISBN 978-0-8218-3776-4. OCLC 60651134. Slater, Robert (1989). Portraits in Silicon. Cambridge, Massachusetts: MIT Press. ISBN 978-0-262-19262-0. OCLC 15630421. Rockafellar, R. Tyrrell (1967). Monotone Processes of Convex and Concave Type. Memoirs of the American Mathematical Society. Providence, Rhode Island: American Mathematical Society. ISBN 978-0-8218-1277-8. OCLC 1318941. Vonneuman, Nicholas A. (1987). John von Neumann as Seen by His Brother. Meadowbrook, Pennsylvania: N.A. Vonneuman. ISBN 978-0-9619681-0-6. OCLC 17547196. Good Housekeeping Magazine, September 1956, "Married to a Man Who Believes the Mind Can Move the World"
Wikimedia Commons has media related to John von Neumann. O'Connor, John J.; Robertson, Edmund F., "John von Neumann", MacTutor History of Mathematics archive, University of St Andrews . Oral history interview with Alice R. Burks and Arthur W. Burks, Charles Babbage Institute, University of Minnesota, Minneapolis. Alice Burks and Arthur Burks describe ENIAC, EDVAC, and IAS computers, and John von Neumann's contribution to the development of computers. Oral history interview with Eugene P. Wigner, Charles Babbage Institute, University of Minnesota, Minneapolis. Oral history interview with Nicholas C. Metropolis, Charles Babbage Institute, University of Minnesota.